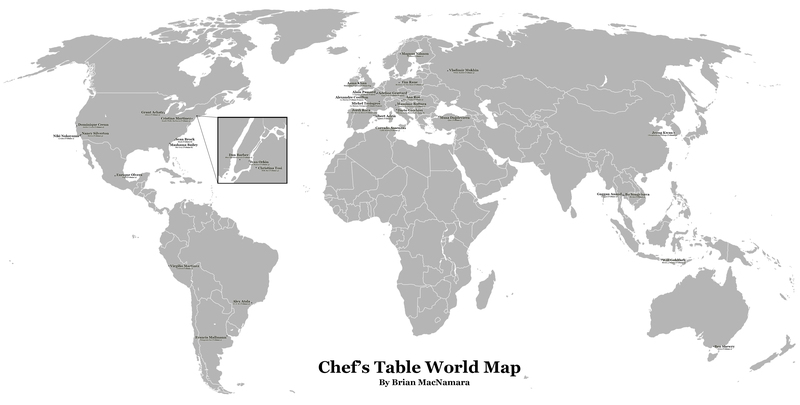 Here we see the map in all its glory, and once I started to put it together it dawned on me just how many chef’s lives we have gotten to explore over the years. Like Alexandre Couillon and his restaurant La Marine in Noirmoutier-en-l’Île, France, who struggled to find his voice in a place set in its way in Chef’s Table France (see review). Or Jeong Kwan who cooks for the Chunjinam Hermitage in South Korea. Who we meet in Volume 3 (see review) who cooks food for her monastery and explores a completely different way of life to other chefs. Also once you plot it out you do see a concentration of locations in Europe, which we have isolated below, North America, and a smattering of places in Asia, The Pacific, and South America. There are no chefs from places like India, or China, or the continent of Africa and while the show has continued to diversify, it would be good to see more work here. When it came to the placing the locations, it was Europe that had the most issues as it took a lot of careful maundering to get all the locations to fit, a problem that I assume is only going to get more difficult as time goes on. As well as this, with this map, I decided that if there were two locations in the same city, like Paris, or Los Angeles, I would leave them as they were but if there were more I would add an inset. For this map the only place I needed to do that for was New York, which I made a bit bigger than I probably needed to once I plotted them all out, but I have a feeling that more will go there by the time we are done. 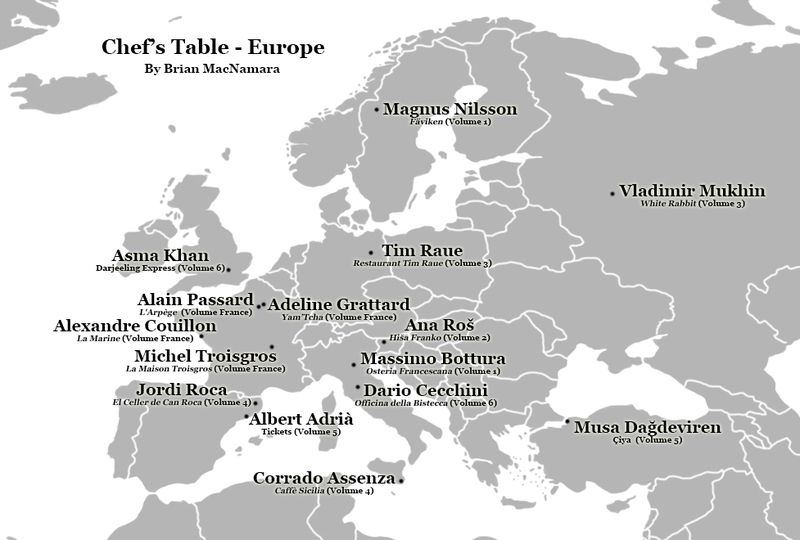 So I hope you enjoyed our map of Chef’s Table, and if you want to see more of our cartography excesses you can click HERE. Have you seen any odd maps in Movies, TV or Video Games? Let us know in the comments below, feel free to share this review on any of the social medias and you can follow us Here. Check out all our past reviews and articles Here, and have a happy day. This entry was posted in Articles, Map-It, TV Reviews and tagged Albert Adrià, Alex Atala, Alinea, Ana Roš, Asma Khan, Atelier Crenn, Attica, Çiya, Ben Shewry, Blue Hill Restaurant, Bo Songvisava, Bo.lan, Caffè Sicilia, cartography, Central, Chef's Table, Chef's Table France, Chef’s Table Volume 1, Chef’s Table Volume 2, Chef’s Table Volume 3, Chef’s Table Volume 4, Chef’s Table Volume 5, Chef’s Table Volume 6, Christina Tosi, Chunjinam Hermitage, Corrado Assenza, Cristina Martinez, D. O. M., Dan Barber, Dario Cecchini, Darjeeling Express, David Gelb, Dominique Crenn, El Celler de Can Roca, Enrique Olvera, Food, Francis Mallmann, Gaggan, Gaggan Anand, Grant Achatz, Hiša Franko, Husk, Ivan Orkin, Ivan Ramen, Jeong Kwan, Jordi Roca, Los Angeles, Map, Mashama Bailey, Massimo Bottura, Milk Bar, Mozza, Musa Dağdeviren, n/naka, Nancy Silverton, Netflix, New York, Niki Nakayama, Officina della Bistecca, Osteria Francescana, Paris, Patagonia Sur, Pujol, Restaurant Tim Raue, Room 4 Dessert, Sean Brock, South Philly Barbacoa, The Grey, Tickets, Tim Raue, Virgilio Martínez, Vladimir Mukhin, White Rabbit, Will Goldfarb by tldrmoviereviews. Bookmark the permalink.